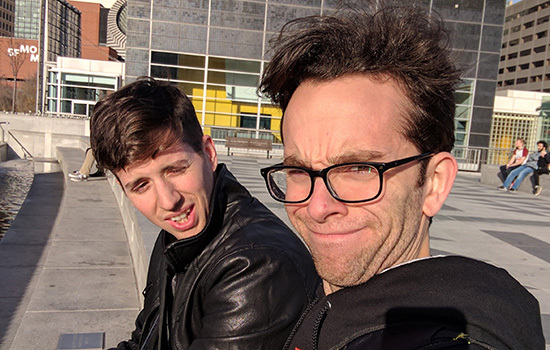 Gary Porter â€™15, left, and Dan Plate â€™16 created the video game <em>Super Daryl Deluxe</em>. The game will launch on Playstation 4 and Steam this spring. Super Daryl Deluxe, an action role-playing game created by RIT alumni Gary Porter ’15 (game design and development) and Dan Plate ’16 (illustration), will launch on the SONY Playstation 4 and Steam platforms this spring. The duo, co-founders of Dan and Gary Games LLC, have been friends since high school in Waterloo, N.Y., and created the company in 2012 when they were RIT students. The game, which allows players to construct their own combat system and features a unique visual style, is set inside a multi-dimensional high school where students and faculty are going missing and classrooms have been on lockdown for weeks. A new kid, Daryl, wanders into town and what starts out as an innocent effort to help jumpstart a contraband textbook business turns into a harrowing quest through the monster-filled school, with saving everyone’s lives as a top priority. The award-winning game has been recognized nationally. In 2015, it won first place in the Visual Quality category of the Intel University Games Showcase at the Game Developers Conference in San Francisco. Later that year, the team and its game took the top prize in the Games category at Microsoft’s U.S. Imagine Cup National Finals, and also won the Taco Bell Indie Game Garage competition. Since then, Dan and Gary Games has secured development funding for Super Daryl Deluxe through partnerships with RIT’s Venture Fund and RIT’s MAGIC Spell Studios. The company is currently a member of RIT’s Venture Creations business incubator.